One of our most important jobs in developing the new operator licence self service system is to make it easier for operators to manage their licences online. We want to hear what you think about the developments we've made so far. Give your feedback on these developments. This is a key part of the work we’ve developed since our last update. In particular, the team is working on the screens that you will see when you first log in or when you make applications. Our main focus is navigation – how you’ll get around the screens and view information about your licence or application. Originally, we set up icons along the top of the screen to help you move around, which we shared with you in our last update. Now we’re working with drop down titles. We want to introduce this navigation style because it will improve your experience of the system, especially during the application process. The layout we’re working on looks like this. When you log into the new operator licence self service system, you will see the ‘home’ screen, which looks like this. 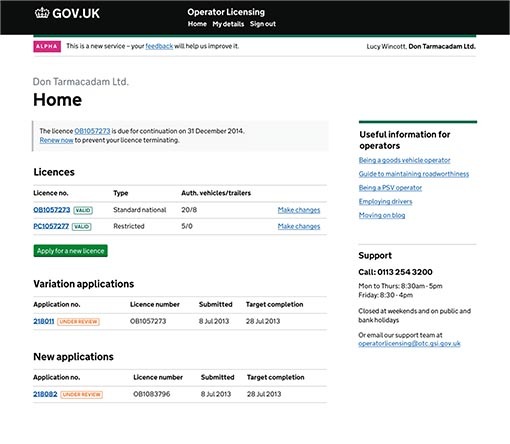 The dashboard format shows basic details about your operator licence(s), including your continuation date, and any applications you have outstanding. The application section shows the date you submitted the application and also the target completion date. This is the nine week service standard – the latest date that you will get a decision on your application if there are no issues. The ‘home’ page also provides useful information and contact details for support with your licence or applications. This is the ‘licence overview’ screen. On the left hand side, you can go from each title to view the details registered against your licence. On the right hand side, you can click on the blue link to update the information registered on your licence. So, for example, if you change maintenance contractor, you’ll be able to tell the traffic commissioner using self service and know that your records are up to date. 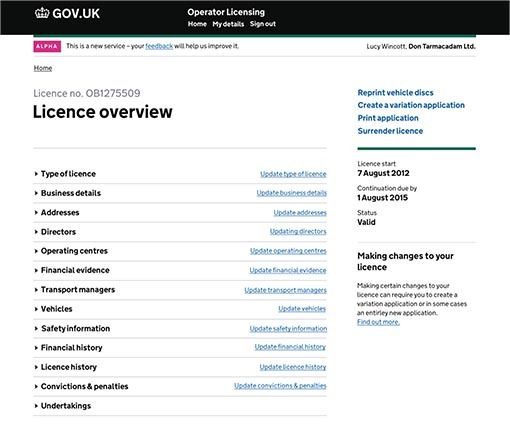 The screen also contains important information about your licence, such as the continuation due date and status, along with links to other online services. We’ve also developed the application process screen, which looks like this. This view shows one of the drop down sections and how we think the information might be displayed. 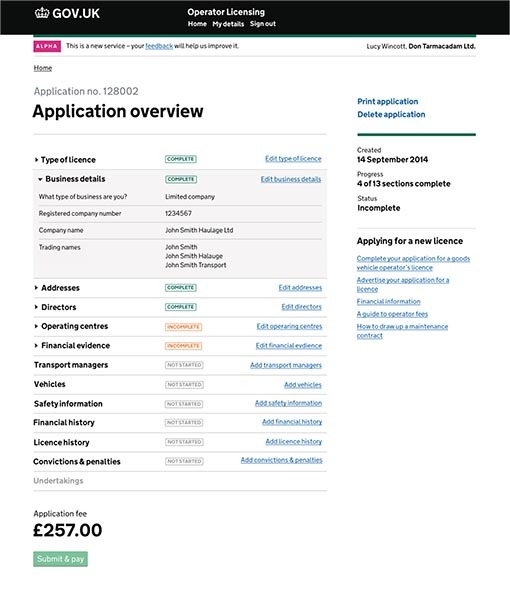 It follows the same format as the ‘licence overview’ screen, with additional links on the right hand side. You will also see that the system shows which individual sections of the application are complete and incomplete. This gives you a live progress report on your application.